Inshore water temperatures in the Little River area are 48-52 degrees, and in the shallows conditions are gin clear. Water temperatures in the surf are about 55 degrees, with conditions fairly clear in the mornings before the wind gets up most afternoons. 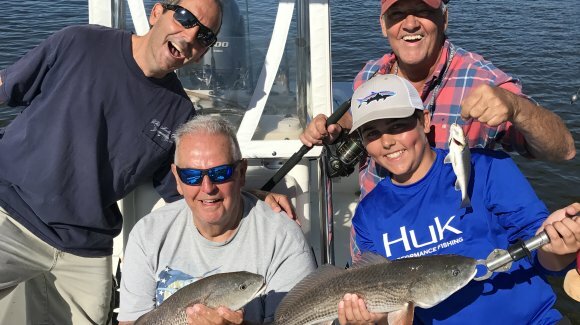 Temperatures have dropped significantly in the last month or so, but despite the falling mercury Captain Patrick “Smiley” Kelly (843-361-7445) reports that black drum, redfish and trout have continued to feed pretty steadily. On most trips they are catching double digit numbers of trout, and even though you could use live bait (particularly mud minnows or live shrimp, if you can get them) Vudu shrimp fished under a popping cork have been working very well. 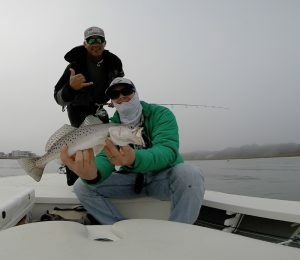 Trout are being caught around ledges in 6-8 feet of water, and the moving water in the middle couple of hours on both the rising and falling tide has been most productive. Redfish have also been biting well at the same stage of the tide, and Gulp! baits as well as fresh, dead shrimp have both been working for reds as well as black drum. “Dead-sticking” the Gulp! has been working very well. They are catching these fish beside docks, in holes in small creeks, and around oyster beds. On lower stages of the tide redfish are also feeding around docks in the ICW. While there are reports of a few flounder being caught, Patrick’s boat has not picked up any. Cherry Grove Pier (843-249-1625) reports that mostly small fish are being caught off the pier, including small whiting, croaker, perch, a few trout, pufferfish, and a couple of surprising (for so late in the season) snapper bluefish.